A life-affirming tale of fantasy, fate, and love. Single mom Erin Flaherty is down on her luck. Not only is she fighting romantic feelings for Father Brendan O’Donnell, St. Anthony’s brown-eyed and broad-shouldered priest, but she also faces a heartbreaking choice. After the vet diagnoses her son’s Irish Setter with a life-threatening illness, Erin must find a way to raise the funds for the surgery that could save him. Unfortunately, the income from her shoe repair business and Irish step-dancing lessons barely put food on the table. When an odd little man appears in Erin’s life, her entire belief system is challenged. Can she keep her faith in the luck ‘o the Irish and the power of love? 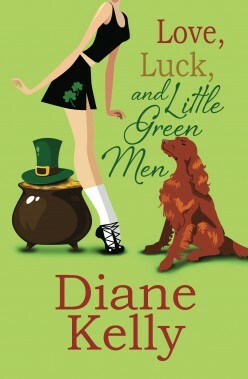 Love, Luck, & Little Green Men is the perfect St. Patrick’s Day treat!